Rodney Bullock is declaring for the NBA Draft, per ESPN, but will not be hiring an agent. Providence forward Rodney Bullock will declare for the NBA Draft, but will not sign with agent, source told ESPN. Testing waters. With the new draft rules allowing for college players to enter the NBA Draft so that they can participate in pre-draft workouts and receive feedback from NBA Scouts and come back to school if they don’t hire an agent, it makes complete sense for anyone that may even a fringe draft pick to take full advantage of that opportunity. Even if you are 100% going to stay in school, the fact that you can obtain more visibility across the NBA with scouts and see where you stack up with future NBA talent is a no-brainer to take part of. The scouts and draft experts can advise you on the specific parts of your game that you need to most improve to help your draft stock for the next year as well. I guarantee that you’ll be seeing the floodgates open with college players declaring for the draft over the next couple of weeks but a lot of them will be coming back. The poor decision would be to hire an agent right away if you are just testing the waters. Why not get a better idea of where you might fall in the draft before putting all your eggs in the NBA Draft bucket? Signed by the Chinese League Xinjiang Flying Tigers to replace an injured Andre Blatche. Appeared in 11 games for Xinjiang. Returned to the Mad Ants. Signed a 10-Day contract with the Dallas Mavericks ($31,969). Played in 3 games for the Mavs becoming the first Ghanaian player to ever appear in an NBA game. After 10-Day contract expired, returned to the Mad Ants. All in all, Bentil made $331,969 in the NBA this year, plus whatever he made in China, which if I were to guess, was significant. I’d say, he probably made about $500K this year. I have no issue with any kid doing what is best for them and their situation. Who am I to judge someone else, their choices, and how can I really understand their circumstances. 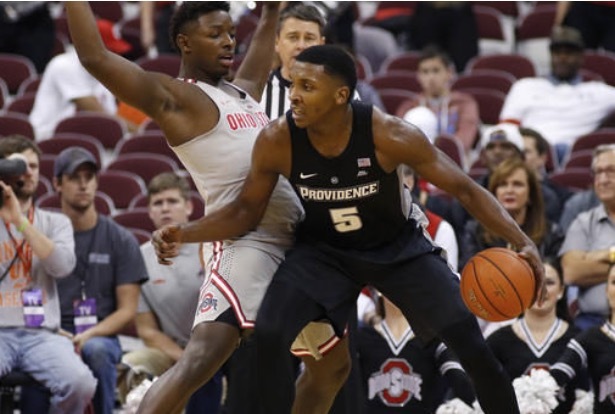 In terms of NBA readiness, yes, I think Bullock (and Bentil for that matter) could benefit from another year at Providence College. Bullock would be returning to a team who’s entire starting lineup would be back after finishing 3rd in the Big East. They will most likely be ranked this year and the spotlight and exposure on them will be brighter. Bullock can also get a feel for what he needs to work on this off-season and implement into his game next year. I would suspect that he could put on a little more muscle, limit his turnovers, improve his foul shooting, and work on his body language. The one other thing that would help is if he didn’t get off to such slow starts, especially against higher competition. I think Bullock will return to school for when all is said and done, but if he were to hire and agent and enter the NBA Draft this year (which is STACKED with talent), then I’ll be rooting for him in the pros and I’ll miss the hell out of his Bullock War Cry.